A graduate of Washington State University with a degree in international communications, Mikkel completed with honors the rigorous program of the Academy for Dog Trainers at the San Francisco SPCA. The National Disaster Search Dog Foundation uses Mikkel as their canine evaluator for Washington State, where she tours shelters looking for dogs who can be trained to serve as search and rescue dogs. She has also been involved with training shelter dogs and has served as the education coordinator for the Whitman County Humane Society. Mikkel has written for Parade magazine, Knight Ridder newspapers, House and Home and Cat Fancy. She coauthors a pet feature with her father for Scholastic magazine, and is a coauthor of the four books in the Ultimate Pet Lover series. To look at this on their website click here. Check out some of the photos from the dog training classes by clicking here! Therapy Certification classes in Sandpoint? Have Rx for dog for mobility and psychological issues. I want to take her on the train but she needs more training – basic obedience okay but distractible and overly friendly. Also, she is protective of toys, balls, sticks etc. with most dogs. Can you recommend a trainer in Sandpoint? Mikkel will be doing a Canine Good Citizen class with tests afterward to certify your dog on Wednesday October 27 at North Idaho Animal Hospital. 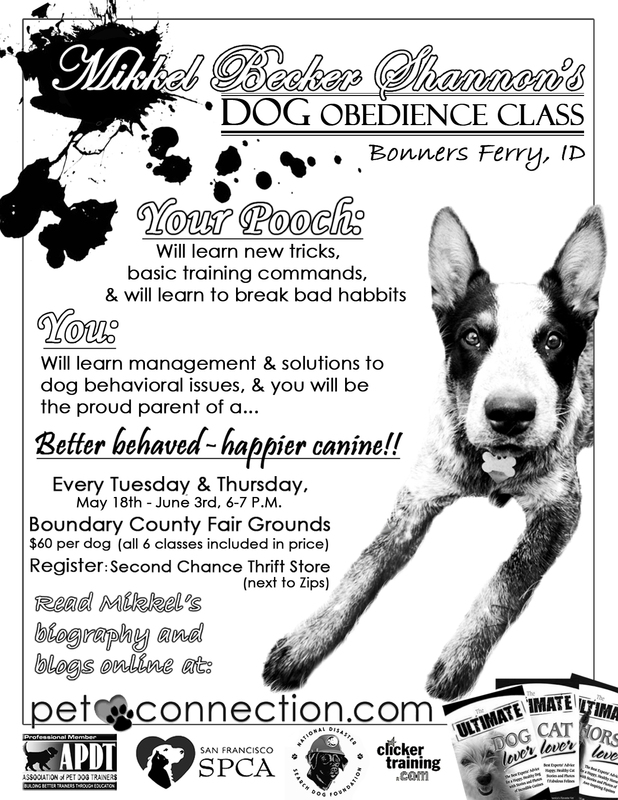 This would be a great class to help your dog unless she would be too distracted by other dogs to concentrate on training. If you are looking for private lessons Mikkel is available in Sandpoint on Wednesdays and I am available most afternoons and on some weekends. Both of us would be able to help you! Previous Previous post: Flyball anyone? Next Next post: So, you think everything is fine when a dog wags its tail?